It’s been awhile since I’ve written specifically about Paris. I reference it a lot and mention some of my experiences while traveling there but never focus on it. That’s a shame! It’s also changing today. Organizing all the information in my brain is a challenge in itself so I thought I’d start easy: 5 Things You Must Do In Paris. This list can expand and it can be edited. Everyone has different recommendations after visiting a particular city. However, if you’re visiting Paris for the very first time, I recommend these five things be at the top of your list. The best advice I ever received about Paris was to be realistic while planning. For example, the Louvre is enormous. If you think you’ll cover it in a day you’d be insane because you couldn’t cover it in a week. Don’t worry, I have a solution to this. Another great piece of advice, manage your expectations. For example, most people don’t realize that the Mona Lisa which is in the Louvre is about the size of a large textbook. So don’t expect a giant canvas. It’s not the Sistine Chapel you’re going to see. If you want large paintings, I have a recommendation for that as well (keep reading). Paris is like any other city in the fact that you have to do your research before you get there. Don’t plan a trip to Paris and wing it. There are far too many things to do and see and there’s never enough time to do it all. There’s nothing wrong with having a flexible schedule. I encourage it. But don’t leave for Paris without a general itinerary of what you’d like to spend your time doing. It will be a colossal waste of funds and time. Paris is not the cheapest city to travel to so if you’re making the trip, take advantage of every second you’re there. #1: Tackle the obvious places. This would be spots like Le Tour de Eiffel and Le Louvre. Sure it might seem cliche to have these on this list. It’s obvious, right? Absolutely, which is why I’m taking it a step further. Le Tour de Eiffel has a few viewing spots and also a restaurant. I did not visit any of these and I’m 100% ok with that. Here’s why...the lines are excruciating unless you get there at opening. 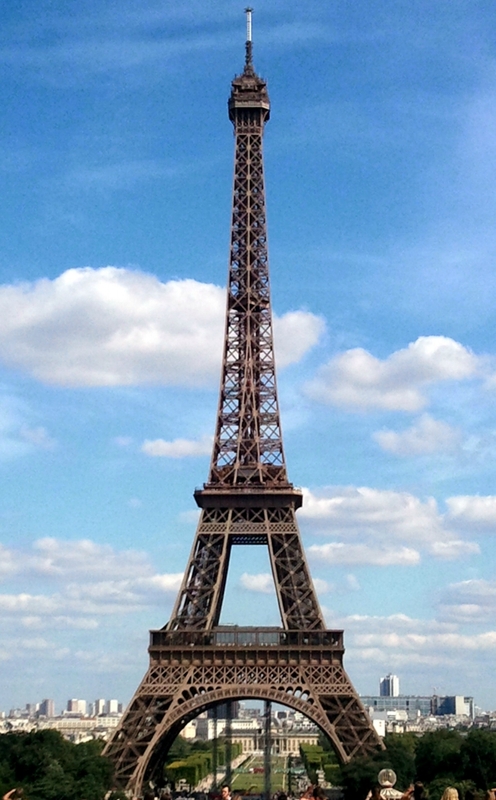 There is a law in Paris that no building can exceed 7 floors. You can get a great view of the city from a lot of spots including #5 below...Le Sacre Coeur. Instead, enjoy a leisurely lunch in the Champ de Mars. It’s much more French anyhow. As for Le Louvre, be specific. This is a must visit even if you only walk along the grounds outside. It’s a magnificent space and the past home of French royalty. It began as a fortress to protect Paris before turning into a place of stay for royals who visited from the Loire Valley. It was in the 20th century that it became what is now known as one of, if not the, greatest art museums in the world. Le Louvre is home to too many exhibits and types of art to count. The best piece of advice anyone can give to those planning on visiting is map out your top priorities. If you want to see Renaissance art, focus on that. If you want to see sculptures, focus on those. Plan to visit a handful of exhibits but don’t expect to cover the entire space. That is unless you have an extended amount of time to spare. #2: Make a trip to Versailles. Located about 45-60 minutes outside of Paris, Versailles is the most famous chateau in France. This palace saw a lot of wealth, a lot of strife and was almost destroyed on the interior during the revolution. It’s actually quite sad if you look into its history. Greed and privilege built this historical space but anger and desperation near destroyed it. It’s since become a treasured piece of French history and has even been home to several monumental political moments like the Treaty of Versailles. Besides having a rich history, Versailles is stunning to visit. The Hall of Mirrors feels almost surreal as you walk through, the royal apartments are larger than my house, and the grounds alone are breathtaking. Let’s also not forget the the Petit Trianon which was designed and built especially for Marie Antoinette. Sorry, no cake included. #3: Drink plenty of great wine but don’t overindulge. Here’s a fun fact about France. You can get a great bottle of French wine for 2 or 3 Euros. I’m talking about quality French wine. Why? Because you’re in France and it comes without all the crazy importation fees! If you love wine and appreciate it, let yourself enjoy great French wine for a fraction of the cost. It is important to note that Parisians don't like drunks, especially loud American drunks. Becoming one will not only disrespect their culture and annoy them, it will make you an easy target for petty crimes like pickpockets and thieves. Drink responsibly. Visit wine bars, attend tastings, do what you will. But be smart about it. #4: Take a trip to MontMartre and visit Le Sacré-Cœur. Remember the part where I mentioned there are great views of Paris not in the Eiffel Tour? Well, here it is. MontMartre is a neighborhood on top of a hill in the 18th arrondissement. The Basilica of the Sacré-Cœur is at the peak and has some of the most mind blowing views of the city. Better yet, those views are free. Le Sacré-Cœur itself is a gorgeous Basilica inside and out. It translates to “The Sacred Heart” and has become a notable landmark in Paris. MontMartre has an interesting history. It’s referenced in Moulin Rouge as being the home of La Vie Boheme, or, The Bohemian Life. They weren’t far off as this was a hot spot for artists in the late 19th century into the 20th century. Artists like Monet, Degas, Modigliani, Picasso and many others you’d be familiar with spent much of their time here. There’s actually an old cabaret spot still there called Au Lapin Agile that hosted many of said artists. You may even find a piece of their work or two along the well-decorated walls. It’s a unique experience, one I recommend, but it’s almost all in French if I remember correct. They’re still in service nearly 150 years later. If that’s not reason enough to go, I don’t know what is. #5: Take a walk through the Tuileries gardens. It might seem like a very simple request but it’s one I cannot leave off this list. The Tuileries are in the 1st arrondissement right off the the Louvre. The gardens are serene yet full of life. They hold beautiful statutes and one of my favorite museums of all time, L’Orangerie. L’Orangerie is where the lily pad paintings by Monet are displayed. The museum also has a few other pieces of art from artists like Picasso. If you’ve seen the movie Midnight in Paris, you get a great idea of what the lily pad paintings are like. They cover the walls from floor to ceiling and stretch across over dozens of feet. They provide such a peacefulness that you don’t want to leave. Silence is requested to respect other guests’ experience. So while you’re taking a morning stroll through the gardens, stop by L’Orangerie for a quick walk through as well. There are so many more things you must do in Paris. Narrowing it down to five is near impossible but it makes for more fun posts that allow me to expand on tips and experiences that I had. These five particular recommendations might not seem like much but I can promise, once you’ve reached your destination and start to take in each experience and adventure, you’ll understand why I recommend them. What would your top five things to do in Paris be?